Calamity Jane was a hard drinking woman all her life. She worked as an army scout and a prostitute, hardly surprising considering her parents died when she was twelve years old. As a child, I was brought up on Hollywood Westerns. John Wayne, Audie Murphy, Alan Ladd... 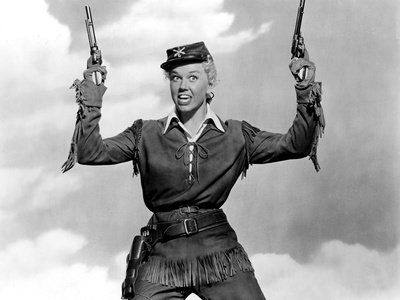 So when I first saw the 1953 film Calamity Jane, starring Doris Day, I was in my absolute element. Doris Day as Calamity Jane beautiful, a great horsewoman and could shoot well, all of the things that a girl-child who was a bit of a tomboy would really loved to have been able to do and be. It all seemed very romantic and glamorous. Little did I know, as a childhood, of the Hollywood ability to alter history? I always loved the Hollywood Westerns as a child. They formed part of our regular Saturday evening TV viewing (all in black and white, of course). Gary Cooper in High Noon, She Wore a Yellow Ribbon starring John Wayne, Red Mountain with Alan Ladd, to name but a few. 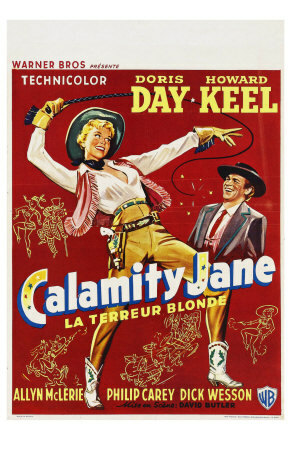 So when I first saw the 1953 film Calamity Jane, starring Doris Day and Howard Keel, I believed it was factually true. This beautiful woman who could sing, was a great horsewoman and could shoot well enough to win an Olympic gold was someone I wanted to be. Little did I know that Hollywood did not always stick to the facts? The first time I realised that the film might not have been factually accurate was in the early 1970s when I was discussing it at work, and someone told me that the truth was more likely to be that Calamity Jane was a prostitute. Of course, I didn’t believe that. I didn’t want to believe that. And it wasn’t until I was researching my recent article on famous courtesans that I found out the truth. Or at least, as near to the truth as I am ever likely to get now. Born on 1 May 1852, in Princeton Missouri, Calamity Jane started life as Martha Jane Canary (sometimes spelt Cannary), the eldest of six children, two brothers and three sisters. Her father was a farmer, but decided to move his family from Missouri to Virginia City, Montana. As was the custom, they travelled by wagon train. Charlotte, her mother, died on the way. Soon after arriving in Virginia City, Robert, her father, moved his family to Salt Lake City in Utah. He died a year later. Martha Jane was 12 years old. She packed up her family once more, and took them to Piedmont, Wyoming. In some ways, it’s difficult to imagine just how hard it must have been for her, in others, it is pretty clear that it would not have been easy to make a living for a young, inexperienced girl who had little in the way of traditional female skills. The majority of accounts say that she worked as an ox driver, a cook, a nurse, a miner and a prostitute. (Hardly seems surprising after in the circumstances!) She could ride a horse well, and improved this skill over time, and, presumably, had learned to shoot whilst helping out on her father’s farm. In 1868, she is believed to have gained employment as a Scout at Fort Russell, with General Custer, whilst, it seems, supplementing her income from prostitution. Apparently, whilst working as a scout during the Indian Wars, she saved the life of Captain Egan – he said, “I name you Calamity Jane, the heroine of the plains.” Other accounts say that she earned the name because men were said to be “courting calamity” if they offended her. I will say though, that these accounts of her whereabouts at the time are unsupported and may not be accurate. There is a lot of controversy about the accuracy of the data. By 1876, Jane became a rider for the Pony Express and settled down in Deadwood, South Dakota. It appears to be around this time that she met Wild Bill Hickok – I say “appears” because Jane claims, in one report that she married him in 1873. Most accounts seem to say that she didn’t ever marry him at all, and that he was married to someone else. Some reports say that they had a child together, but it appears that she would have had to have given birth during the time that she was working as a scout for Custer, which seems implausible. Wild Bill Hickok was killed in 1876. Although Jane stayed in Deadwood, she was working conveying goods and machinery to various camps in the area, but also working in a dance hall, which, I believe, is a euphemism for prostitution. When a smallpox epidemic broke out, she helped to nurse those who had become infected. Jane left Deadwood in 1877, rejoined the Cavalry and then moved on to Fore Pierre. However, she went to California in 1883 then to Texas in 1884, and met Clinton Burke in El Paso. She married him in 1891 after having lived with him for several years. It is fairly certain that she gave birth to a daughter two years later. However, their marriage broke up in 1895. Jane placed her daughter in a convent and joined Buffalo Bill’s Wild Show, where she performed sharp shooting. Jane, who had been a hard drinking woman all her life, got drunk and fired. This became her normal practice with whatever she did, whilst travelling around Minneapolis, Chicago, and other cities. She returned to Dakota for the last time in 1903. She was in the last stages of advanced alcoholism, but secured herself a place at a brothel, where she did the cooking and the laundry. She was buried nest to Wild Bill Hickok on Mount Moriah, which overlooked Deadwood. I know the series was shown over here but I didn't get to see it. I'll try to find it on one of the cable channels. Was that the one with Ian Mr Shane? My favorite portrayal of Calamity Jane is in the HBO Series Deadwood, played by Robin Weigert. She was quite a character in the show. Who was Lady Godiva and did she really ride through Coventry naked? An American man banged his head and claimed to have woken up in an alternative reality, where the Beatles never split. He came back with an album to prove it. For over seventy years, Staffordshire people have been seeing a strange entity in the Chase. Is there really a humanoid pig on the loose?